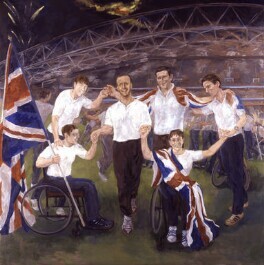 John Lessore's major portrait of six gold medal winning Paralympic sportsmen and women including, Tanni Grey Thompson and Simon Jackson, is the centrepiece of this display to celebrate the 2004 Olympics and Paralympics in Athens. An ambitious new portrait celebrating the achievements of British Paralympic athletes will go on display at the National Portrait Gallery on Tuesday 15 June 2004. The Paralympic Games take place once every four years in the same city and year as the Olympic Games. They were founded by Dr Ludwig Guttmann, an eminent neurologist who had been using sport in the rehabilitation of Second World War veterans with spinal cord injuries at the Stoke Mandeville hospital in Aylesbury, England. Artist John Lessore was later in the same hospital where he met Dr. Guttmann and has dedicated this portrait to his memory. The first official Paralympic Games were held in Rome in 1960. Since that time the Games have developed beyond the initially exclusive participation of the spinally injured to incorporate many different types of disability. In Sydney, in 2000, four thousand athletes participated from 125 countries. 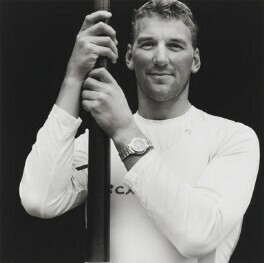 The painting is displayed alongside 11 photographs of fellow Olympians including Sir Steve Redgrave and Denise Lewis by Sheila Rock and eight newly acquired photographs by Anderson & Low and Michael Birt. Birt's subjects are the Paralympians, Tushar Patel and Lee Pearson and Olympic hopes Amir Khan, Marlon Devonish and Jo Fenn. New works by Anderson & Low show athletes training on location and feature the British Cycling Squad at the Manchester Velodrome, the yachtsman Ben Ainslie and the rower James Cracknell.